I always try to use everything. Waste not, want not… The greens in this dish are from the beets I used in making the Salad with Salt-Roasted Beets, Pecans, and Blue Cheese earlier this week. They were just as good as the salad. I love it when the things I purchase have multiple uses. I plan on using beets a lot more in the future. I hope you do too! (The basis for this recipe found on simplyrecipes.com). In a large skillet or 3-qt saucepan, cook bacon until lightly browned on medium heat (or heat 1 Tbsp of bacon fat). Add onions, cook over medium heat 5 to 7 minutes, stirring occassionally, until onions soften and start to brown. Stir in garlic. Add water to the hot pan, stirring to loosen any particles from bottom of pan. Stir in sugar and red pepper. Bring mixture to a boil. Add the beet greens, gently toss in the onion mixture so the greens are well coated. 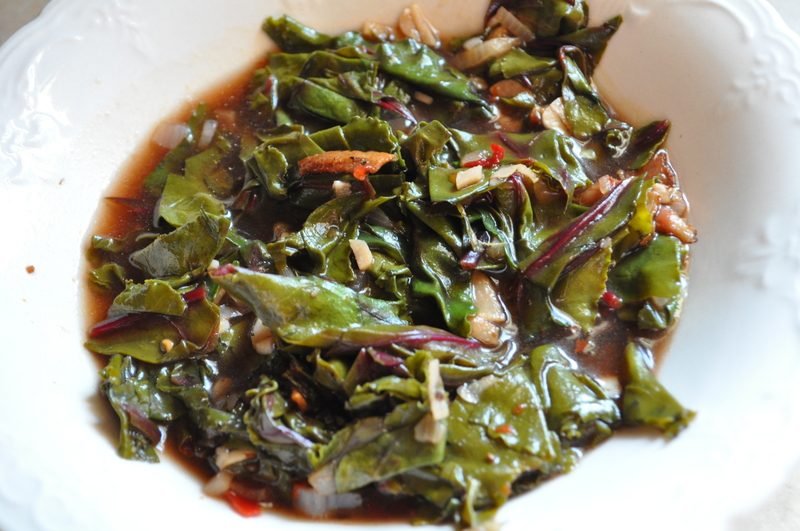 Reduce heat to low, cover and simmer for 5-15 minutes until the greens are tender. Stir in vinegar. Your last greens were soooooo good! These looks just as delicious. I seem to have a serious love of bacon with them.